The first of my typewriters that I thought of when I read this intriguing item in the July 1909 issue of Typewriter Topics was the lovely little Royal Companion portable I brought home with me from WordPlay in Cincinnati last October. I had taken it on my flights home as hand luggage and probably made a little bit of a fuss when passengers boarding after me moved things about in the locker above my head. I explained it was a vintage typewriter and needed to be handled with much care. Invariably, one thing led to another and I talked about having been at a typewriter collectors' convention in West Virginia. I'd be asked by the people sitting beside me if they could see the machine, and they couldn't resist pressing a key. "Skiteing" is what we call it in Australia. In Scottish this word refers to heavy drinking (see below) and in the North of England "skite" means "a quick, oblique blow or stroke; a chopping blow" - which might perhaps best describe my typing style. When I got the Royal home, eager to type with it, I found the carriage skipped, and suspected I must have done something to upset it by taking it out of its case a few times and using it while on board planes. So I must confess to feeling a wee bit miffed when, a couple of months ago, Brisbane Typospherians Steve Snow and Scott Kernaghan visited me and Steve asked if he could have a type with the Companion. 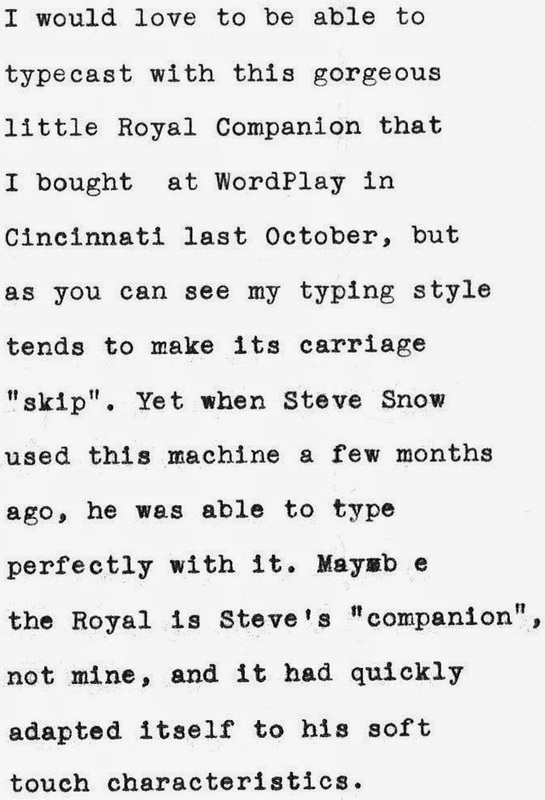 My jaw dropped as I watched the Royal behave immaculately upon Steve's touch, and Scott offered the opinion that it was my typing style that made the carriage skip. Richard Polt has a great typing style and I know he has used this portable without problems. I tried typing a little more gently with the Royal this morning, and that seemed to work, until I momentarily forgot myself. 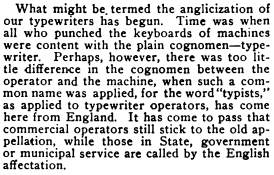 The 1909 Typewriter Topics item, however, would seem to confirm what many Typospherians already suspected, that the same model of different typewriters perform much differently from user to user. There are countless instances of Typospherians reading that such and such a typewriter is a poor typer, yet finding the model to type perfectly well for them - or, of course, vice-versa. The Everest, the Olivetti Valentine and the Smith-Corona Series 5 all spring immediately to mind (though, generally, Olympia SMs and Torpedo 18s are found to be universally pleasing). Many of us do believe typewriters "have their human side", and are "ready imitators" of our typing styles. Perhaps the Royal Companion was just not meant for me, while my Erika 9 is (other Typospherians who have used my Erika 9 seem to remain a little bewildered as to why I rate it so highly). I used the Erika 9 as the prime example of what to me is the "perfect typewriter" in the poll Richard Polt held a while ago, and of course that poll revealed a vast array of preferences held by Typospherians. 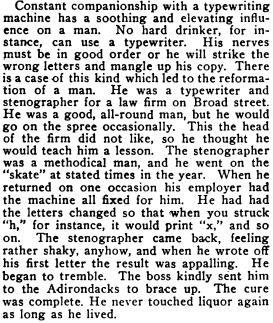 Still, I find it interesting that typewriter aficionados have been aware of this phenomenon for at least 105 years! Apparently there is such a thing as Adirondack Alcohol Addiction Treatment Programs. Aha! That confirms my theory! I've found that invariably, in all the machines in my collection that tend to skip when typing, you can fix the problem by experimenting a bit mainly with the speed at which you type. I've had this same issue with my two Royal Quiet DeLuxe and my Olivetti Lettera 22. The Lettera I know it can have the escapement adjusted (somehow); but the Royals work like a dream when I find the right typing tempo. And once you find the right tempo, you can type on them for hours! Maybe our Royal portables are the mechanical equivalents of the spoiled divas in our collection? So, for us modern typists the trick is to find that ellusive "holy grail" typewriter is to find one that was owned and used soley by someone decades hence with exactly the same typing style as us now... or is typing style like a finger print - no one is alike? Duh? What's ya smokin' out there in the sticks, Jasper? Hence? What's hence (a fortnight hence) is a type-in here with Ray Nickson on July 6. Are you in with your Continental? Hmm, yes - these are mechanical spring-mass systems that would perhaps change/wear according to use. When I first used my Noiseless Portable, it was impossible to type without it skipping madly. With the kind advice from the Typosphere, to use staccato, it was possible to find the 'style' of this machine and it works just fine with an even print quality now. I find my typewriters all type depending on how good of a rhythm I have when using them. Some are quite tolerent of my sloppy typing - like my Underwood SS. 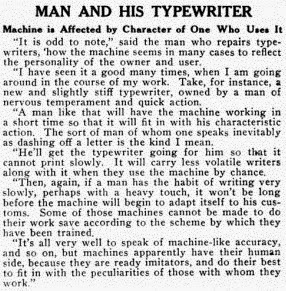 Others do not tolerate sloppiness on the part of the typist -- all of my Olympia machines. Others fall some place in between. While many love Olympia machines I find they are excellently engineered and manufactured, but slow typers. Heremes 3000s fall somewhere between fast and slow, but fail to jam even when I have a sloppy rhythm. I agree with the artile and Rovet G's assessment of a manual machine matching the typist. I completely agree. my touch works well with Royals that other people have mad skipping problems with, yet I have only met one Hermes 2000 that didn't skip madly for me. I had a Royal that skipped a great deal... then one day it stopped skipping. I do believe that I over time my time my style changed until it matched the way the typewriter wanted to work.